Essen is the main city in Germany's Ruhr District, the country's industrial heartland. The area is known for its steelworks, coalmines and smokestacks, and isn't famous as a place to enjoy the outdoors. But little-known to most people, Essen has a big area of wooded hills and water along its southern side, perfect for running. 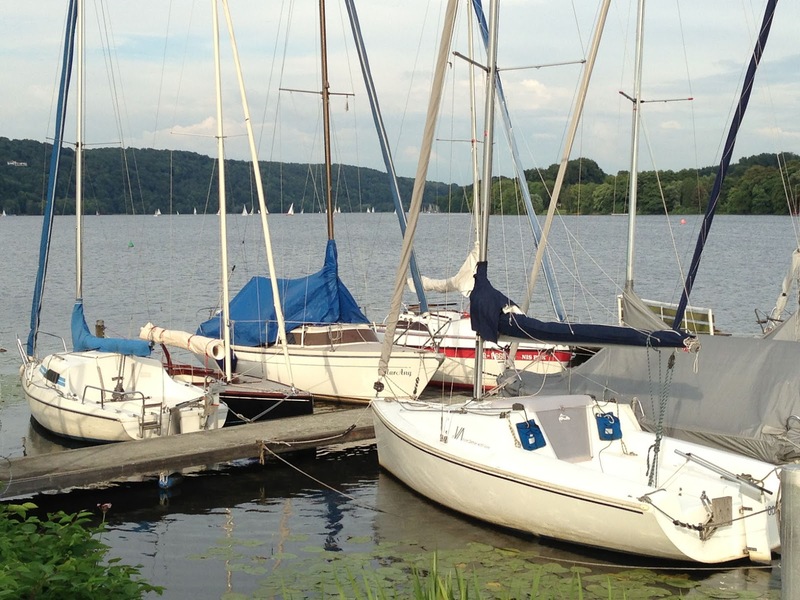 This route circles the Baldeneysee (Baldeney Lake), lined by pedestrian trails and woods, with lots of boat clubs and their docks, cafés, beer gardens, campgrounds and public beaches. The crescent-shaped lake is really just a dammed-up section of the Ruhr River. The dam was built in the 1920s, creating a new recreational heart for Essen. This is one of the longer routes that you'll find on this website, but is well worth it. But if you don't feel up to running the whole loop, just turn around wherever you please. This route will start at the commuter-train station called "Hügel", located just below Alfred Krupp's hillside mansion, Villa Hügel. So if you are staying in central Essen, you can easily get to the lake from the main station (take the S6 train towards Rattingen). 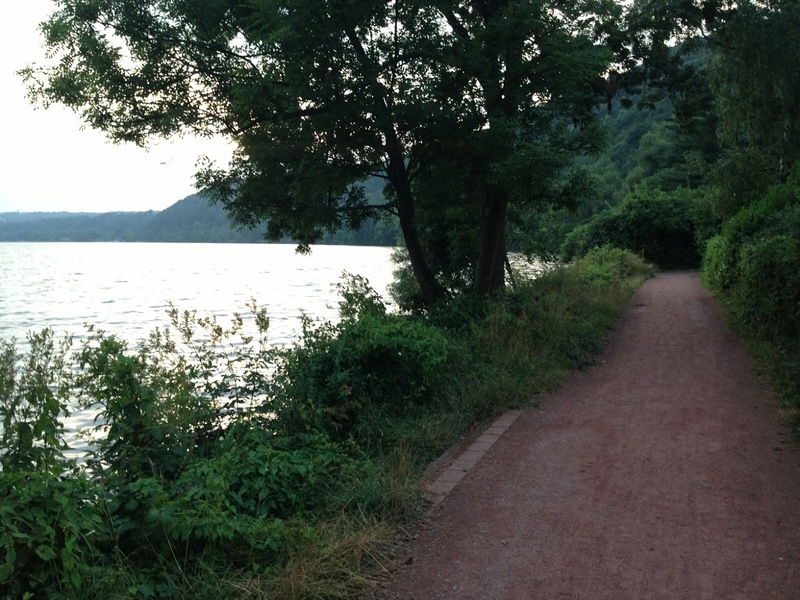 Leaving the train station, just go down the steps to the lakeside road, Freiherr von Stein Straße, and turn right to keep going downhill. You'll see the lake across the road. Take the first turnoff on the left, which takes you into a parking-lot for lake visitors. 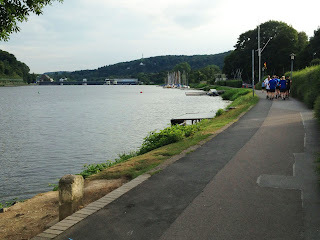 Just run straight past it to the lakeside, where there is a big seating area for crowds to watch rowing races. With a simple run like this, you could run in either direction. The north shore, where we are now, is mainly lined by small pedestrian paths, whereas the south shore follows a little-trafficked street, mainly used by inliners, bikers and runners. I turned right here and circled the lake counter-clockwise. Doing that, you will see the dam just 700 meters away to the west. 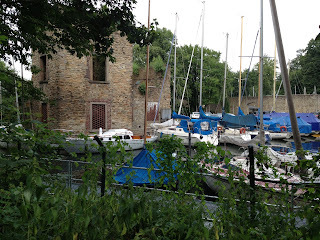 Run along the paved trail, going by little marinas. When you reach the dam, take the steps up to the top of the dam and run across it to the south side of the lake. Then turn left and take the steps down to the little road lining the lake. 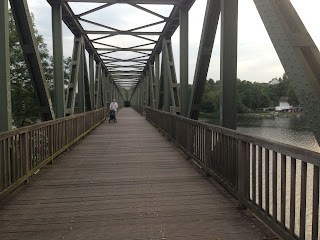 You now just basically follow this road, the Hardenberger Ufer, heading east. You do this until you reach the first bridge, 6.7 km later, where you cross back again. On this south side of the lake, you'll go by more boat clubs, the Haus am See café (very cool spot), and a big campground. There will be very few cars on the road: only people going to and from the boat clubs and campground drive here. 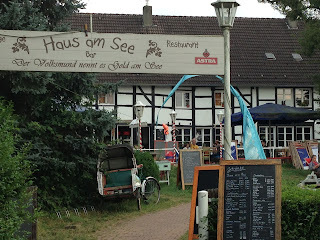 Haus am See garden café: maybe this should be the end of the run! 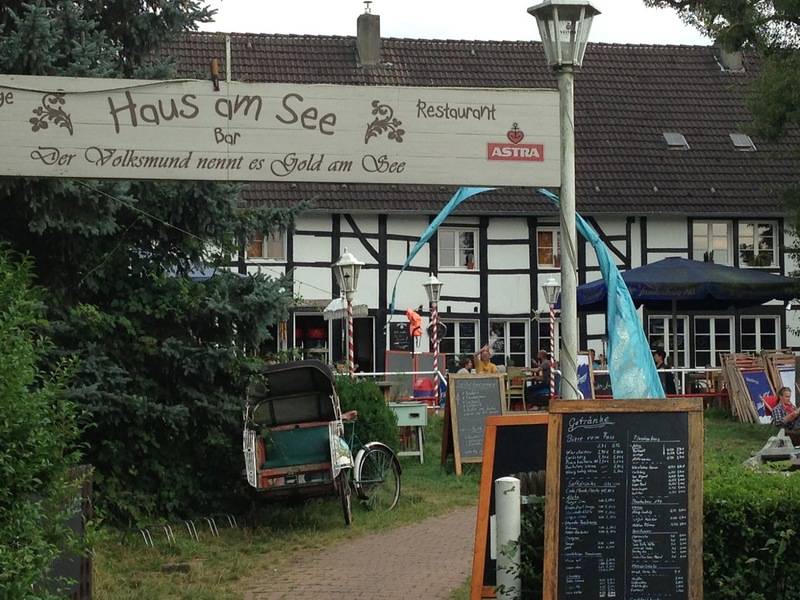 When you pass the campground, at the 5-km mark, you'll come to a castle ruins, Haus Scheppen. The water-filled moat is used as a little marina. Make sure you follow the trail to the left as it stays along the side of the marina, keeping you next to the water. The main road goes off to the right. Now there will be just nature along the rest of the south shore until it curves to the left at the 7.5-km mark, where a neighborhood is built along the shore, Kupferdreh. You are now getting close to the bridge back to the north shore. You will see it straight ahead. The bridge is an old railroad bridge. The tracks have been removed and the old railway bed is now used as a trail for bikers, hikers and runners. 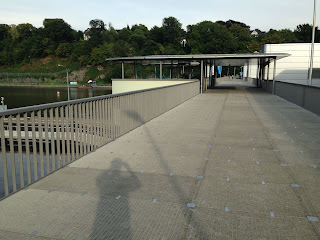 When you reach the green metal bridge, take the steps up along the right side, at the boat club restaurant. Now run westwards across the bridge. At the other side, you will come to a woods. You could run straight along the old railway bed, where the trail is perfectly flat and straight, but it's more beautiful to turn left at the shore and follow the dirt shore path along the lakeside. 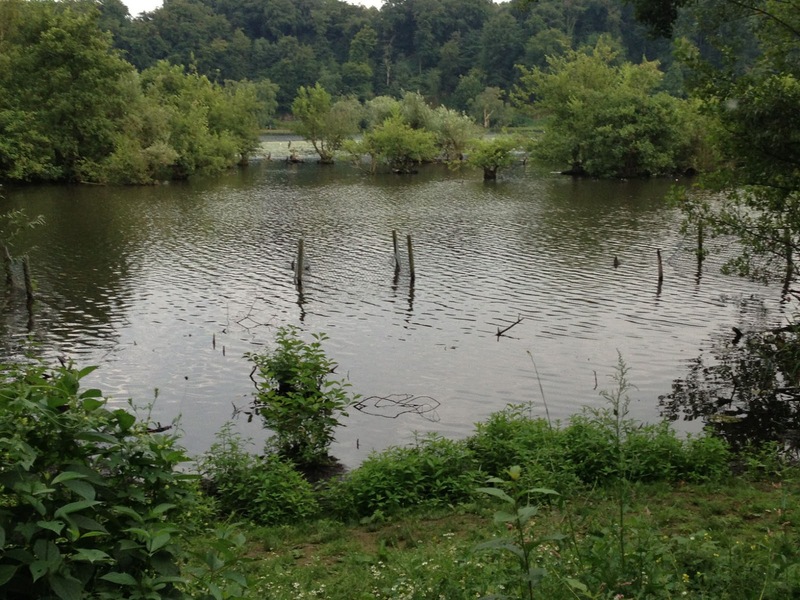 You'll find the most beautiful nature of the run here, in the nature preserve called the Heisinger Bogen. There are little islands along the shore, and a lagoon along the right side. At about the 9.4-km mark, you will need to go inland to go around a boat harbor. After another 300 meters, look for the blue pedestrian-trail sign to bring you back to the water. 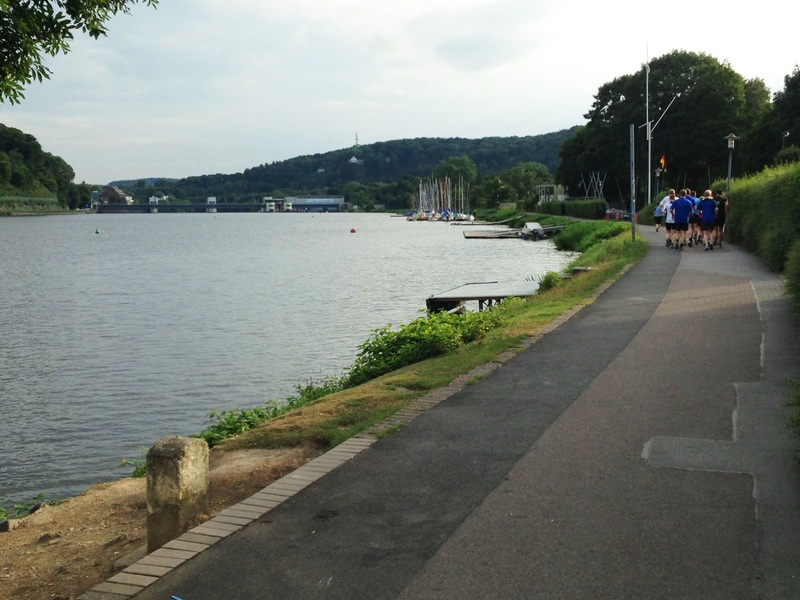 At the 11.2-km mark, the trail joins into a paved pedestrian path next to Freiherr von Stein Straße. You'll pass another castle ruins, then go under a bridge, and then run along the back side of the public swimming area before the trail turns back to the waterside. Now you just run west along the water, past a row of boat clubs and restaurants. When you pass the bleachers for the rowing course, turn right at the Regattahaus, with its lookout tower and clocks on the roof. 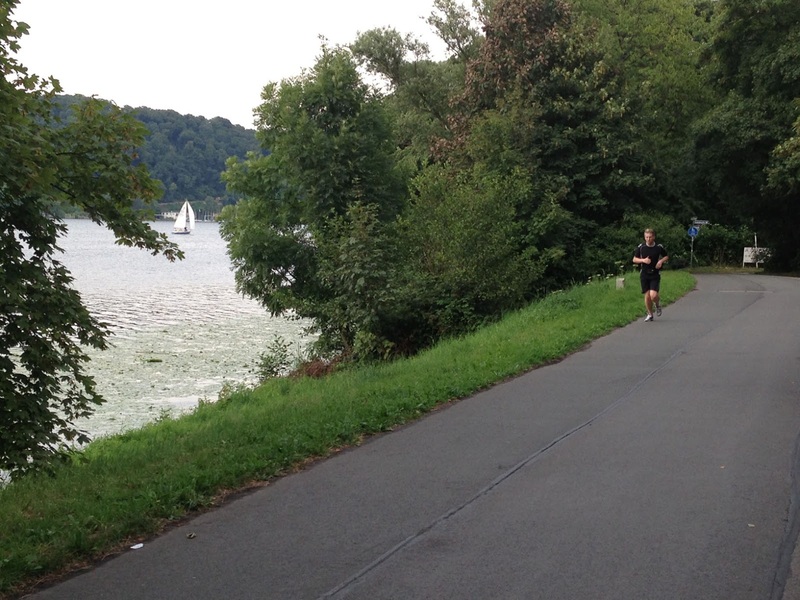 Now just run back uphill to the Hügel train station again. A long run, but one you'll never forget!